F-series still going strong - 87K for March! Lincoln stopped the bleeding of the first two months, only down 2.1%, but that's entirely due to Navigator up 90.7% to 1,711 units. Everything else was down (except bizarrely MKT). On a side note - what's the point in having a Monthly Sales Reports section if nobody can post in it? I'd post these there (where they belong, but I don't have access). Last edited by 2b2; 04-03-2018 at 12:04 PM. Ford cars are starting to slow their descent. Interesting to see Focus outsell Fusion. I imagine the increased fleet business this month may have something to do with that. Mustang down slightly but they stopped its hemorrhaging as it heads into Spring with the new 2019s. Expedition sales are finally growing with the new model as retail overcomes their tremendous fleet sales on the previous model last year. Still nothing spectacular here in-terms of sales volume but they should be massively more margin-rich. Escape is running a pretty big deficit for the year which is something you don't really want happening with the most important volume and growth segment. So far Edge is the only SUV with positive sales growth for the year but Explorer growth is coming back along with EcoSport which should hopefully reverse Ford's SUV decline over the next few months. Ford's Truck and Van business is massive and growing. Looks like they can quietly phase out Taurus and Flex pretty soon, those sales are approaching "Other" status. 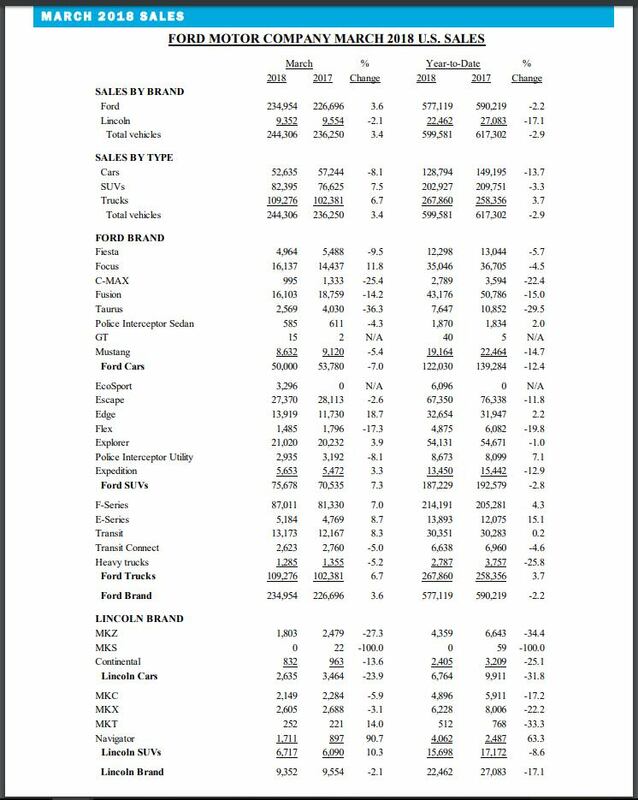 Lincoln still adding to its sales deficit for the year but at least it's slowing. Navigator has to be making some money for them. Lincoln sedans are really hitting the brakes now, MKZ most of all. It's down by over 1/3 so far this year. Continental is actually settling down fairly well, about where I expected them to be. It's not a growth segment and I would be amazed if it's still in the 800's throughout this year. With Focus and C-Max about to be stopped, I imagine sales will change somewhat through the end of the year, it will be down overall but hopefully they'll get some customers into other slower selling vehicles. Bellanca4.2, joseodiaga4, Bloggin and 1 others like this. Last edited by Assimilator; 04-03-2018 at 01:09 PM. 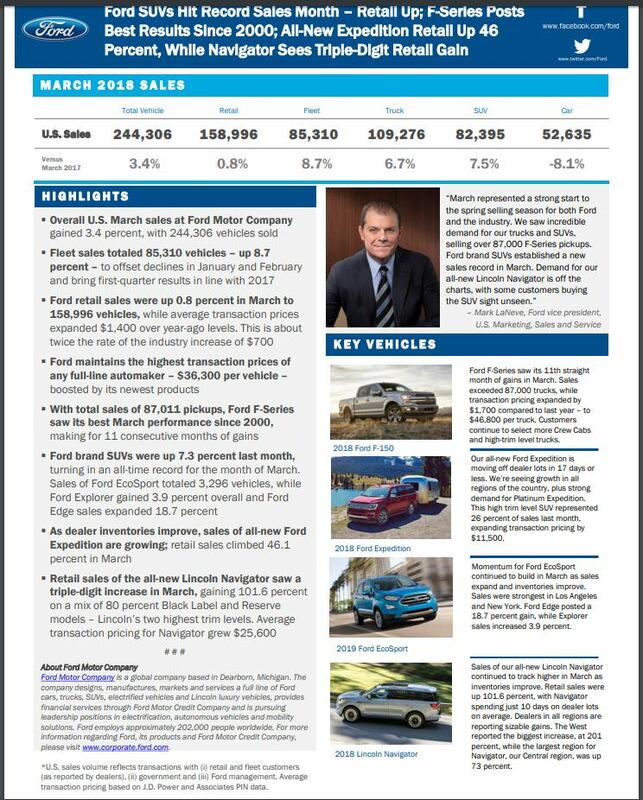 Wow Ford brand sold exactly 50,000 cars! Neat. Bloggin and LEDandSafety like this. Last edited by Assimilator; 04-03-2018 at 01:37 PM. I'm confused what ATP means. I know it means Average Transaction Price but does that means the difference between the average price that customer bought per vehicle for this month compared to this month last year? Meaning at $25,600 difference, it would be last year, customer paid average $60,000 for Navigator but this month, customer paid average $85,600 for the same Navigator with same trimline, options, etc.? Or does it means something else as far as ATP? Regardless, $25,600 is an impressive figure. 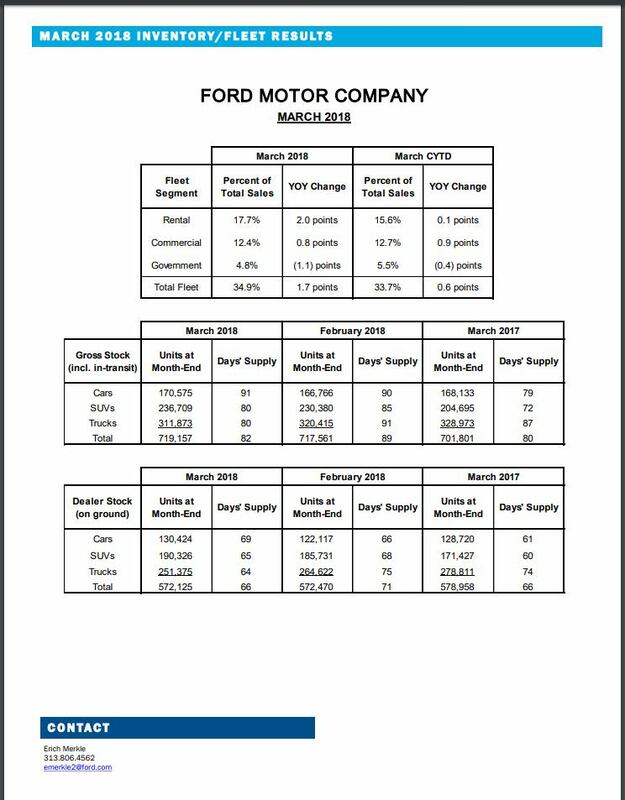 Ford is doing quite well this month. Cars will improve hopefully with new Focus and Fusion(?) but the existing trucks and SUVs figures are very impressive! Yes, everything you just said confirmed what I had previously thought but wanted to know for sure. Glad I asked and thanks for explaining so clearly. Did you know? Ford's sales of 87,011 F-series pickups with an average transaction price of $46,800 equaled $4 billion in revenue in March, making it the auto industry's most valuable franchise. 2b2, Darlene and Assimilator like this.